“Eat more healthily” is a popular New Year’s resolution. It’s on our list too – a push towards eating more vegetables and less meat, exploring more variety, and developing kitchen skills. Last Monday’s new recipe: warm lentil salad with sausages, which I found while looking for warm salads to enjoy this winter. Lentils have become one of our kitchen staples. W- makes rice and lentils in the rice cooker for a simple, filling weekday or post-gym meal. I wanted to find other ways we could prepare lentils so that we could play around with different tastes. I looked for a non-dairy salad that I could put together mostly with ingredients we usually have around, and the warm lentil salad with sausages on Epicurious fit the bill. 1 tablespoon finely chopped garlic – Yeah, right. I put in five cloves of garlic. In a medium saucepan (after having gone through several options from the cabinet), combine the water, lentils, and bay leaves, bring the water to a boil, and lower the heat to a simmer. Chop the other ingredients, checking the saucepan occasionally. In a 12” skillet, drizzle some oil and sauté the onions and garlic for about a minute. Add the carrots and celery. Cook until slightly softened. Realize you’ve forgotten to add Italian seasoning / thyme, salt, and pepper; season the vegetables, mix them up, and cook them until softer. Check on the lentils and salt them too. After a few more minutes, the lentils should be tender. Worry about overcooking the lentils. Drain them and pick out the bay leaves as you see them. 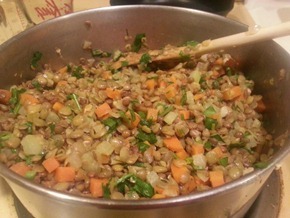 Mix the lentils and vegetables in the saucepan. Contemplate whether to make this a vegetarian dish or to put in the sausages as well. Decide to go with the sausages. Look up how to roast sausages; put them in a 400F oven, turning them when you remember. In a small bowl, whisk apple cider vinegar (or red wine vinegar, if you have it), mustard (or Dijon mustard, if you have it), and salt and pepper. Add olive oil, whisking constantly, until it looks about right. Pour the dressing into the saucepan. Mix it in and taste it. Realize that it doesn’t quite taste sharp enough, so make up another batch of dressing and put that in too. Keep the lentils on low heat while waiting for the sausages to finish. Try it out before announcing the availability of dinner to others in the household. My next steps in lentil awesomeness: buy lentils in bulk from Kensington Market or a good bulk food store, and experiment with growing them in our backyard. (Did you know that Canada is the world’s largest export producer of lentils, according to Wikipedia?) Buying lentils in bulk should work out cheaper than the fancy 500g organic lentil packages we get from The Sweet Potato. We’ve had fun growing peas and beans, so lentils might work out well in our garden too. Exciting!